Enter a world where the time you spend with an Arabian horse is the best part of your day – where the beauty, athleticism and heart of the oldest pure breed of horse in the world comes to life. Whether you are a show enthusiast, an active trail or distance rider or simply enjoy spending time with horses, the Arabian horse is perfect for every discipline, every age and every adventure. Plus, view, download and print our FREE educational material about Arabian horses and AHA programs! Comprised of 23,000 youth and adult members, the Arabian Horse Association (AHA) provides a variety of opportunities for you to immerse yourself into the Arabian horse lifestyle. 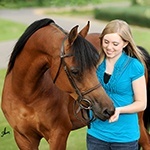 AHA is a full-service breed association and registry for owners of Arabian, Half-Arabian and Anglo-Arabian horses. We offer a variety of activities, programs and competitions that allow you to explore the Arabian breed through many avenues. Above all, we strive to serve those who love and cherish the Arabian horse. 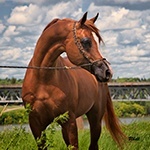 The Arabian horse is the oldest pure breed of any horse in the world and the foundation horse whose blood runs through nearly every light horse breed known today. 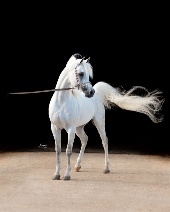 Refined in physical appearance with a large dished face, expressive, wide-set eyes, an arched neck, high tail carriage and an elegant way of moving, the Arabian horse is a picture of beauty and versatility. The breed was borne of the desert and raised by Bedouin tribes. Loyalty, a kind spirit and endurance are bred into these horses' very souls. Whether you enjoy riding, showing, endurance or simply having a family-friendly horse at home, the Arabian horse is the ideal choice. AHA provides a variety of programs and activities for becoming involved with Arabian horses. Our T.A.I.L., Learn to Ride and Discovery Farm programs allow equine enthusiasts of every age to enjoy the touch and feel of the Arabian horse. If competition riding is your passion, AHA offers incentive and prize money programs, achievement awards and more to enhance your show ring or endurance riding experience. Youth and family programs make it easy for people of all ages to be actively involved. When you become a member of AHA, the possibilities are endless. AHA promotes the humane practice of equine care and welfare. No matter what breed of horse you enjoy, healthcare and welfare practices that promote kindness and love towards the four-legged animals that we love are paramount. Use our General Equine Care and Welfare page as a guide for promoting good practices in horse ownership.